It is no secret that Soho is my favourite area of London. Over the last few years, the vibrant suburb has seen fantastic restaurant after restaurant and cafe after cafe open their doors to welcome very grateful customers. I am fascinated with the history of Soho – from a vibrant jazz scene in the 1940’s followed by the rock scene in the 60’s to becoming home to London’s gay scene and let’s face it, a lot of unsavoury bedrooms (look up at night and you’ll see the redness that I’m talking about), Soho is culturally diverse and never seems to sleep. It’s an area that I love and one that I’d live, work and play in for the rest of my life if I could. One thing that seemed to be lacking, until recently, were good chocolate and cake shops. Although they look mouth watering, the cakes at Princi don’t really cut it for me. And the cakes at Hummingbird Bakery do not exactly float my boat. 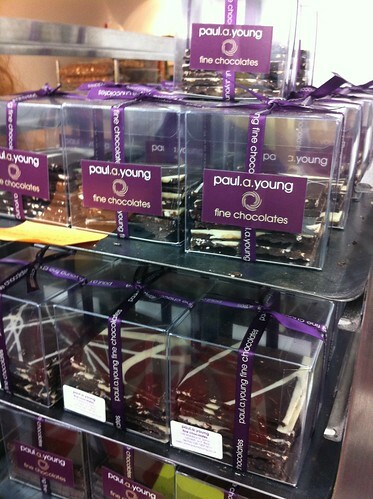 But from today, my worries need be no more as my favourite chocolatier, Paul A Young, has moved to town. Quite literally. Having been a permanent fixture at his new Wardour Street location for the last month, Paul has moved closer to the area to concentrate all of his efforts into this magnificent chocolate heaven. The striking shop, with it’s luxurious purple fronting, sits on the corner of Wardour and Broadwick Street. Step inside and marvel at the huge round wooden table that holds a number of Paul’s handmade creations. The custom made chandelier and gold trimmings add to the luxury but the real plus point for me was learning that the shop isn’t just a beauty, it’s sustainable too. Every piece of furniture in the shop is either recycled, upcycled or reclaimed. Head down to the kitchen, spotless and gleaming white might I add, and you could be shocked to hear that the basement was used as a club in the 60’s but has been virtually untouched since. That is, until Paul’s builders moved in with a tonne and a half of concrete to reconstruct the beautiful archway that leads from kitchen to a large staff changing and rest room area. Brand new shiny and slippery British granite slabs sit in the middle of the room. 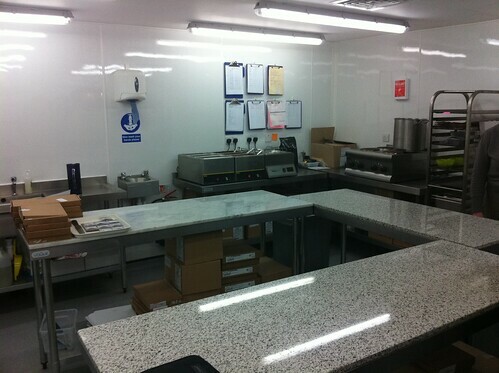 But considering that they will be using these slabs to produce all of the chocolates for the site and that there are currently 110 products and 25 different chocolates being worked with, I can’t imagine the surface will remain shiny and slippery for much longer! The majority of staff that have been recruited have little to no experience with chocolate, or working in kitchens for that matter. I like this fact. Paul is willing to take on staff, train them up to his exceptionally high standards and give them a chance to learn the art. 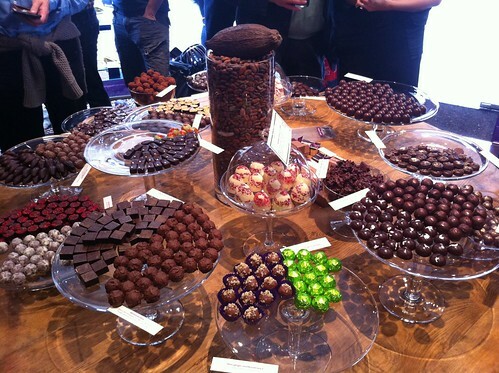 And it is an art, learning to temper and produce top quality chocolates can take between 8 months to a year. One thing that Paul will be able to do now he has this new found space is more classes, which can be held down in the kitchen while the shop is open without disrupting any of the day to day work. They can end when the shop closes at 8pm and the class can make their way upstairs to purchase a few goodies to take home with them if they like. I had met Paul a couple of times before the new opening and have always been struck by his passion. His drive and determination to be the best and maintain the excellent quality that everyone is now accustom to is apparent. He’s still using these same methods that he started with 5 years ago and continues to shun compounds, concentrates, essences, artificlial preservatives and additives. 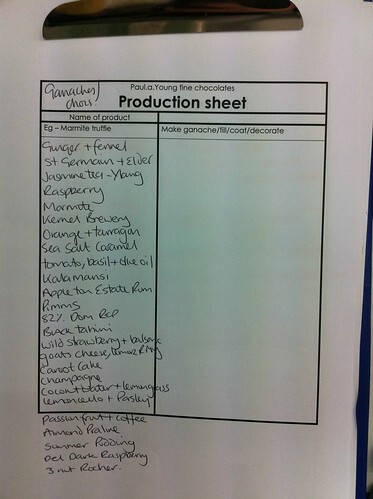 Instead, he uses fresh ingredients, spices, organic pure distilled essential oils and fresh fruits. And rightly so. His chocolates are some of the best I’ve ever tasted. Which leads me on to the chocolates. If I had my way (and enough time), I would have made my way around the whole table. Alas, I wasn’t living in my dream world but I did grab 4 or 5 delicious treats. I started with orange and tarragon, which turned out to be the winner. 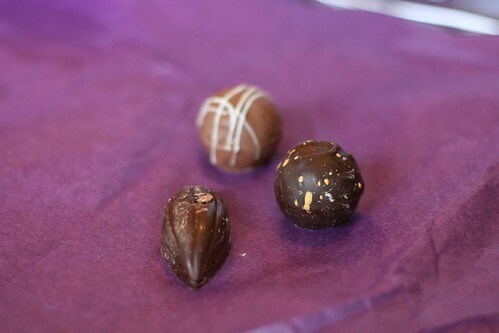 A liquid orange encased in a dark chocolate shell with a tarragon sprinkle on top. Also a winner on the texture front. Next up was almond praline. A robust 50% Madagascan milk chocolate with toasted almonds. Utterly smooth and moreish. The delicately dark raspberry looked fantastic and has a silky texture. The spiking of raspberry on top not only looked striking but tasted delicious. On my way out, I grabbed a small piece of the blondie, which I’ll definitely be going back for. I was also given a goody bag containing a bar of 64% Madagascan with Maldon sea salt, a fudge brownie and a bag of three single chocolates – kalamansi, carrot cake and 82% madagascan pod. Of course I had to try them for research purposes. The kalamansi is a tangy, citrus flavour, wrapped in a dark chocolate coating. I enjoyed the textures of the carrot cake, rich, silky and milky. The madagascan pod was slightly too bittter for me but my boyfriend who prefers his chocolate this way devoured it. The brownie is staying in the fridge for another day but as I have tried one before, I know I’m in for a dense, rich, gooey chocolatey treat. Flavours that I didn’t get around the trying but will be heading back at the first available opportunity to try are ‘St Germain liquer with elderflower, wild strawberry, balsamic & black pepper, black sesame tahini and rare jasmin tea & ylang-ylang. 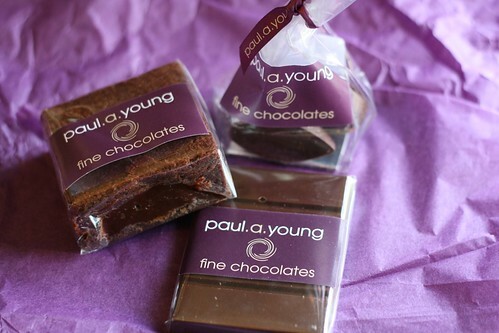 If you’re ever in the area and in need of a sweet treat, I urge you to go and try some of Paul’s delicious flavour conbimations. I promise, you won’t find them anywhere else.